Please complete the below form to either: A) add a personal tracker (SPOT or inReach) to the live map, or, B) hire a map-integrated, Trackleaders rental SPOT ' Gen3 ' tracker. Payment / check-out is through PayPal (account not required). Once the tracking map is created (about a week out), participants should show on tracker within a half hour of registration. Batteries: Rental SPOT Gen3 trackers *DO NOT INCLUDE* batteries. All SPOT trackers are powered by four, triple-A (4xAAA), *lithium* batts. Energizer 'Ultimate Lithium' ( model L92 ) is the only disposable lithium AAA available in North America. 2 sets may be required to complete the route. Participants renting SPOTs are responsible for timely return shipping to Trackleaders. Return address will be provided by email. Used to communicate sudden route changes or for troubleshooting tracker issues while on trail. 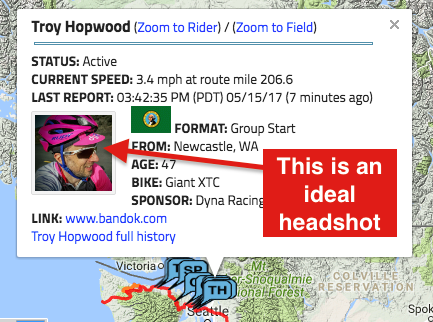 Upload a headshot or avatar image similar to above example (optional). Avatars are shown in athlete's dot pop-up window. Size is only thumbnail (100px), so if submitting image of self, extreme close-up is best. Requirements: jpg format, 1.5mb Max size. If possible, please resize close to 200x200px. VERY IMPORTANT: In the event SOS signal is engaged, SPOT Emergency Response Ctr in Houston, TX, (managed by GEOS Response LLC) will call the above contact number SECOND in the response chain. First response is to summon local emergency services (Sheriff, SAR, State Trooper). If you USE SOS, be prepared to assume all responsibilities (financial / legal) of such a response. Please copy and paste your link. Your shared page should resemble the example in the field. If you do not have a PUBLIC (not password protected) share page link of this form, tracking will NOT work. To learn how to obtain a Share Page URL for your tracker, please watch this short slideshow. I understand location data transmitted from my SPOT device and broadcast to the online Event Tracker is unofficial and not intended to ensure Athlete safety. The live map is for entertainment purposes only. After clicking the submit button, you will be redirected to Paypal to complete your registration. You will receive a confirmation email from "Trackleaders registration" (noreply@jotform.com) when all done.